WW1 Reenactments Equipment : Great War Tommy WW1 Documents, Paperwork : Booklet Cover - Pigeons. WW1 Reproductions and WW1 Reenactors Equipment / Kit - Booklet Cover - Pigeons. 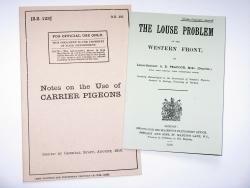 Buff card cover only (6"x4" approx) for "Notes On The Use Of Carrier Pigeons", S.S.123, O.B.305, of August 1916. For all fanciers of "Speckled Jim"? Handy as a cover for a pocket booklet.